It’s no secret when Dolly Parton puts her name on something, success follows. 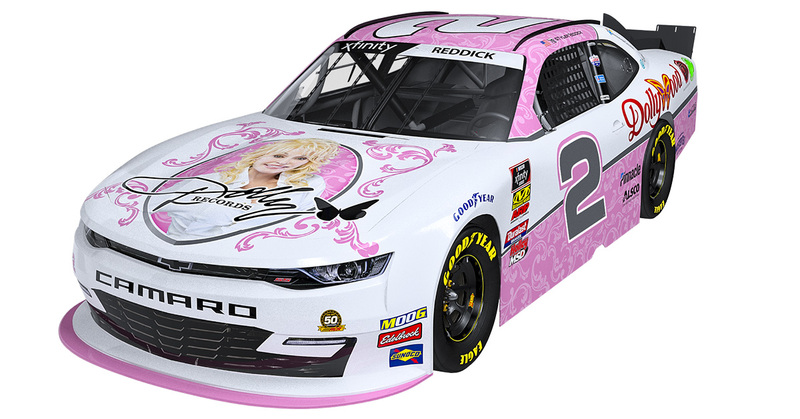 NASCAR Xfinity Series driver Tyler Reddick hopes the same holds true during Saturday’s Alsco 300 (TV coverage on FS1) at Bristol Motor Speedway. Ahoy mateys! Dolly Parton is making good on staking her claim in Pigeon Forge with the construction of the Pirates Voyage Dinner & Show, her newest attraction in the Smokies, and the treasure – buried and otherwise – already has begun to arrive and take shape at the venue. Construction on the Pirates Voyage building, located on the Parkway adjacent to The Island in Pigeon Forge, began the first week in January. 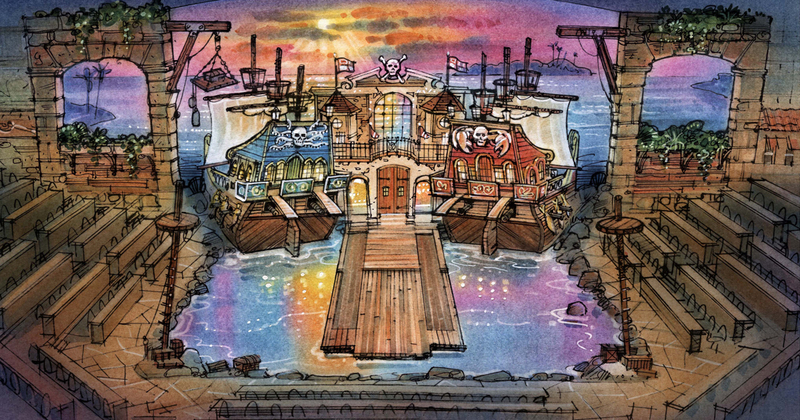 The first – and biggest – task was to “build” the lagoon, the centerpiece of the set that will house the two pirate ships where the action of the entire show takes place. The digging of that foundation required removing more than 281 loads of dirt via dump truck for more than a month (that’s 4,500 cubic yards or 7,500 tons of dirt! ); that part of the project was completed on Feb. 22. That 15-foot lagoon soon will hold 300,000 gallons of water. The installation and finishing of 600 cubic yards of concrete and 50,000 lbs. of steel in the 30,000 square foot arena began the week of Feb. 25. When Dolly Parton opens her new Pirates Voyage Dinner & Show in Pigeon Forge later this spring, the fun and adventure starts when guests first arrive at the entertainment attraction. The elaborate exterior of the building gives people just a small glimpse of the excitement that awaits during the show, which includes magnificent pirate costuming and special effects. Visitors will walk underneath a waterfall on their way to pick up their tickets to begin their Pirates Voyage. An extensive nationwide talent search began as soon as this entertainment project was announced last fall, and the cast of 20 has already begun show rehearsals and intense training for the acrobatic and diving skills required of pirates and mermaids alike in this show. One of the most anticipated phases of construction will happen in late March when the exterior starts to take shape and the large Pirates Voyage sign is placed outside the building. Set to be complete in May, the construction phase is a $9 million project, in addition to the initial investment in the property for a total of $28 million. Now Booking Online for all 2019 shows. Guests can also call 865-505-AHOY (2469). Follow Pirates Voyage on Facebook for the latest updates! Keep an eye to the spyglass, mateys; Dolly’s pirates will be searching for treasure in the Great Smoky Mountains, next summer! After nearly a decade of rave reviews and financial success on the Carolina coast, Parton’s newest Pirates Voyage dinner attraction is slated to open in the spring. When complete, the 21,000 square foot arena, adjacent to The Island in Pigeon Forge, will be the stage for Crimson and Sapphire pirates to battle on deck, in the water and in the sky above their full-sized pirate ships in a 15-foot-deep indoor lagoon. 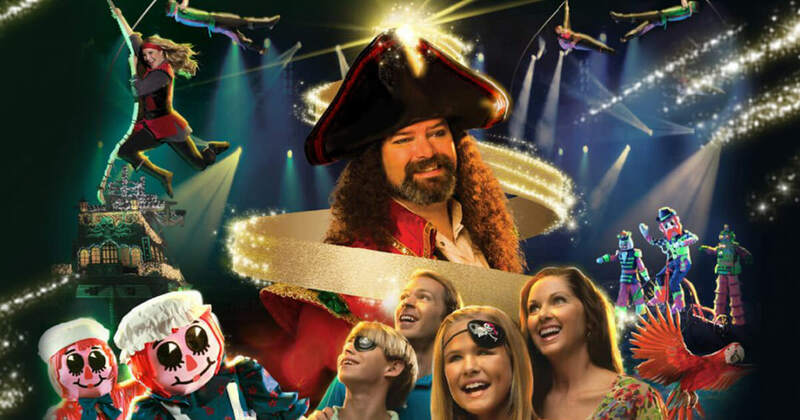 Spectacular acrobatic competitions, live animals and an original music score by Dolly Parton and Mark Brymer creates an immersive adventure experience all while guests enjoy a spectacular five-course pirate feast. This holiday season, Pirates Voyage Dinner & Show brings a perfect pirate Christmas to Myrtle Beach, South Carolina. Opening on Thurs., Nov. 1 and running through January 5, 2019, crews of all ages are invited to experience festive entertainment, swashbuckling fun and a four-course feast fit for celebrating the season. The yuletide adventure begins in the Pirates Village, where an interactive experience awaits with a pirate holiday sing-a-long. Kids also can be “transformed” into pirates and mermaids at the Village’s “Join the Crew” area, while several crew members spread Christmas cheer. Then, guests are invited into the Buccaneer Bay arena for the main holiday show, a thrilling spin on “A Christmas Carol” with Captain Scrooge that requires all hands on deck. Captain Scrooge takes guests along as he travels through time with the Mystical Christmas Spirit to find the true meaning of Christmas, including a “dream” where giant toys come to life and perform amazing acrobatics high above in Buccaneer Bay. A comical Christmas castaway and her companion add to the jolly adventure; then, the pinnacle of the Pirates Voyage holiday experience is a live Nativity featuring the three wise men on live camels and an angel with a very special message. At “Myrtle Beach’s #1 Choice for the Holidays”®, guests will continue to be thrilled with an epic battle between the crimson and emerald pirates. The competition between the two pirate crews unfolds on land, on deck, in the water and high above two full-sized pirate ships for the coveted Christmas treasure. During this swashbuckling Christmas spectacular, guests are served a fabulous four-course holiday feast straight from Captain Scrooge’s galley. The meal begins with voyager creamy vegetable soup and buccaneer bread. Next, guests receive “half o’ roasted cackler” (chicken), Captain’s barbeque pork, cob o’ buttery corn, and a pirate herb-basted potato. Apple o ’me eye pie and unlimited Coca-Cola® products, tea or coffee complete the meal. Vegetarian and gluten-free meals are available by request. Call 1.800.433.4401 or visit Pirates Voyage to book. Pirates Voyage takes its swashbuckling crew of characters on a Christmas adventure! The holiday adventure starts in the Pirates Village, where a cast of pirates entertain show guests with an interactive experience that includes a pirate holiday sing-a-long. Folks will experience the 12 Days of Christmas with a pirate twist – everything from ten crewmen leaping and six Jolly Rogers to a parrot in a palm tree! Kids can enjoy being “transformed” in a pirate or mermaid makeover at the Village’s Join the Crew area. Then, guests will enter the arena for the main holiday show, a swashbuckling spin on “A Christmas Carol” with Captain Scrooge and his faithful first mate Bob Cratchit. The Mystical Christmas Spirit takes the captain through time to find the true meaning of Christmas, including a “dream” where giant toys come to life and perform amazing acrobatics high above the indoor lagoon. 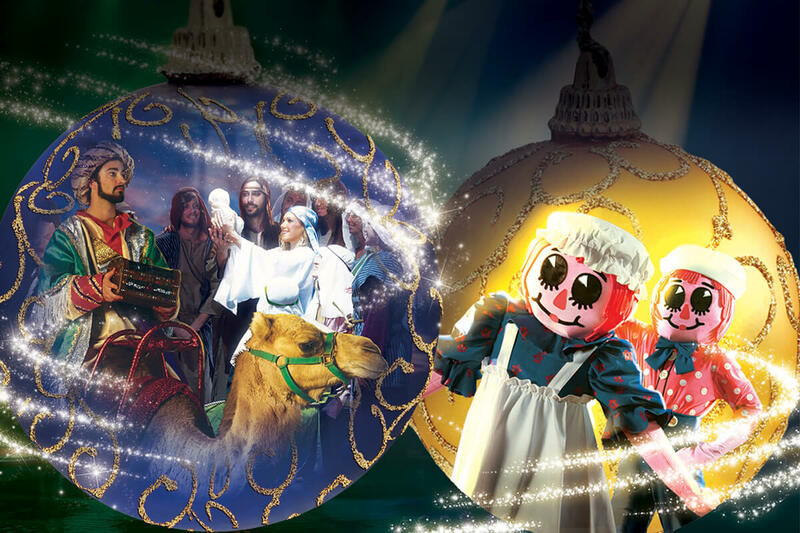 A comical Christmas castaway and her sea lion companion add to the fun and festive adventure; then, the pinnacle of the Pirates Voyage holiday experience is a live Nativity featuring the three wise men on camels and an angel with a special message. At “Myrtle Beach’s #1 Choice for the Holidays,” guests also will be thrilled by an epic battle between the crimson and emerald pirates as they compete for the coveted Christmas treasure. During this swashbuckling Christmas spectacular, guests are served a fabulous four-course holiday feast straight from Captain Scrooge’s galley. The meal begins with voyager creamy vegetable soup and buccaneer bread. Next, guests receive “half o’ roasted cackler” (chicken), Captain’s barbeque pork, cob o’ buttery corn, and a pirate herb-basted potato. Apple o ’me eye pie and unlimited Pepsi products, tea or coffee complete the meal. Vegetarian and gluten-free meals are available by request.